Police are appealing for information after a woman was robbed outside a bank in the Waterside. 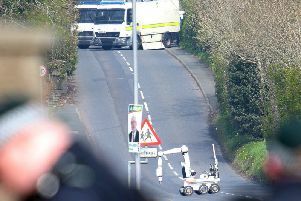 Police are currently examining a suspicious object found in Craigavon tonight. They have closed the Tandragee Road, Monbrief East Road and Tullygally East Road following the discovery near Drumbeg Roundabout. Local diversions are in place as the object is being examined.